With the high excitement level of all the activities I did while I was in FL, it got me thinking. I really think I ride in a hot air balloon. I have no idea where they do them, I see them on the occasion floating thru the sky... but how cool would that be? 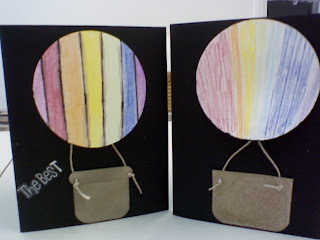 With that in mind I tried to make Hot Air balloon cards... I am still working on them, but I am overall pleased with the beginning. I am most please with the buckets, and will indeed keep tweaking the balloon. I really do not know, I never gave it much thought!